How to Lose a Double Chin - Reduce and Firm. See My Results! Want to know how to lose a double chin naturally? While you can NOT spot remove excess fat from your face, chin or neck; you can improve the appearance and "de-puff" those areas through face exercises and massages. Excess weight - If you're overweight or carry excess weight in your face, neck and upper body; the best way to reduce a double chin - is of course - to lose weight. 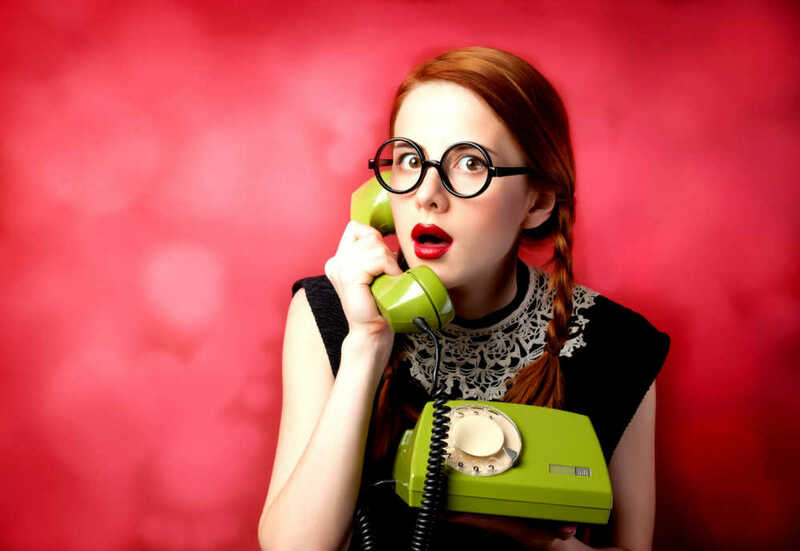 You can help de-bloat the face and double chin area with a facial massage. A facial massage can help slim and contour the face and neck area. Plus, it's excellent for your health since the lymphatic system is linked to a healthy immune function. loss of natural fat pads from specific compartments of the face; like cheeks (malar fat pads) and the nose/mouth area (nasal labial fat pads). facial muscles weaken and start to sag. facial bones start to shrink. All of these factors contribute to significant facial volume loss which causes facial features to droop downward; adding volume to the lower part of the face which can look like a double chin. 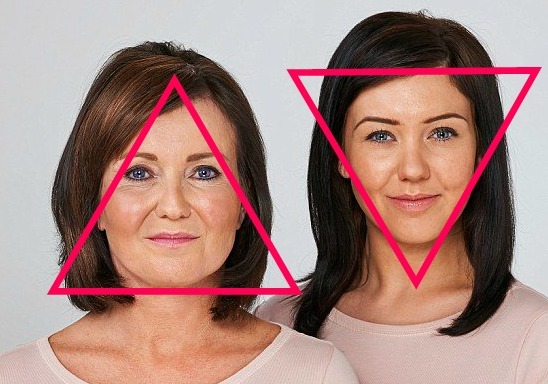 Think of a young face shape like an upside down triangle. With age (and volume loss) this triangle becomes inverted causing the lower part of the face to look heavier and fuller. When performed on a regular basis, face and neck exercises can help maintain a youthful face shape as you age, as well as firm up the double chin area. Build up and tone muscles creating much needed volume and lift. Tone skin due to increased blow flow and production of collagen and elastin. Prevent facial bone loss. As we age the bones in our face begin to shrink. This process contributes to classic signs of facial aging and a double chin. Click here to learn more about Facial bone loss. Which face exercise workout should you do? There are some wonderful face exercise programs available. But for the price, workout time, ease of use, and wonderful customer service - I've selected Carolyn's Facial Fitness workout. But regardless of which workout you select, make sure it's comprehensive and workouts all 57 muscles of the face and neck. You don't want to spot train your face. It's essential to exercise all your facial muscles for best results. Place the pads of each thumb in front of the other, resting under the chin, fingers resting against the jawbone. Press your tongue against the roof of the mouth and then slide your thumbs, alternately to back (to where the under chin meets the neck), making a rhythm of one thumb slide for every tongue press. You should be able to feel the muscle under your chin as you slide and press your thumbs. Do this for a count of 40, 3 times a week. 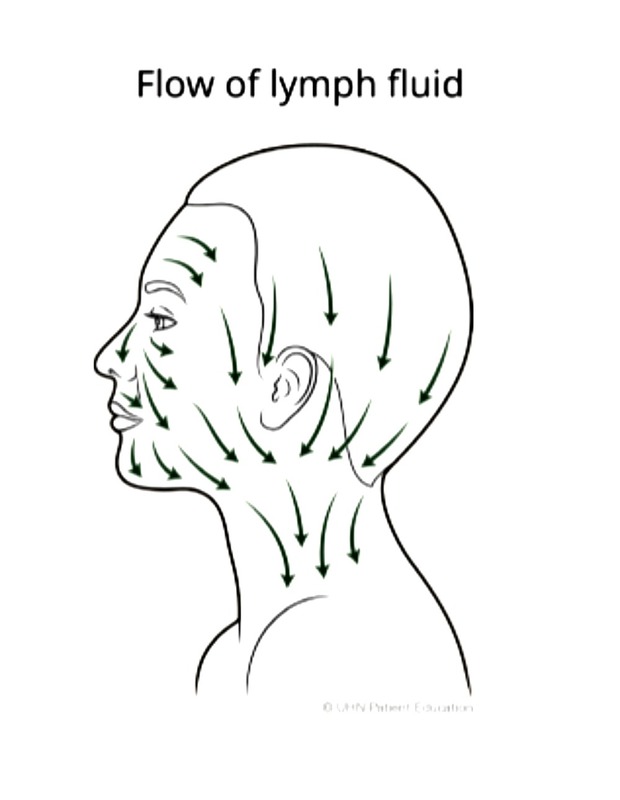 In addition to facial exercises, a face massage helps the lymphatic system remove excess fluid and toxins. This can help reduce bloating of the face and neck. And, as a side benefit, it can boost your immune system. "A lymphatic drainage facial is a soothing and relaxing massage using gentle but effective brushing motions to reduce swelling in the eye and neck area, as well as the rest of the face." "As a beneficial side effect, your immune system is also boosted." says Dr. Barbara Strum from Aesthetic Medicine. While the most common way to perform a massage is with your fingers, as show here at massageaholic.com. But, if you have a hard time using your hands due to arthritis or other issues you can use a massaging tool like the Kansa Wand. The Kansa wand allows me to massage harder and longer since it's easy to hold and my fingers/hands won't tire as easily. This massaging wand helps improve circulation, encourage lymphatic draining and "de-bloat" the entire face and neck, improving the appearance of puffy eyes and double chin. Always perform the massage on clean skin that's been lightly oiled. You want to create a nice smooth slide across the skin. The Kansa wand comes with a free bottle of oil, but any facial oil will do. I followed the directions that came with my Kansa wand. For best results you want to start at your forehead and work your way down to your chin and neck. It feels wonderful and sometimes I lose myself massaging my face, neck, and shoulders while watching TV. But when I'm finished with a full face massage, I'll do an extra massage for the double chin area. Raise your head and place the wand on the left side of your under chin area. 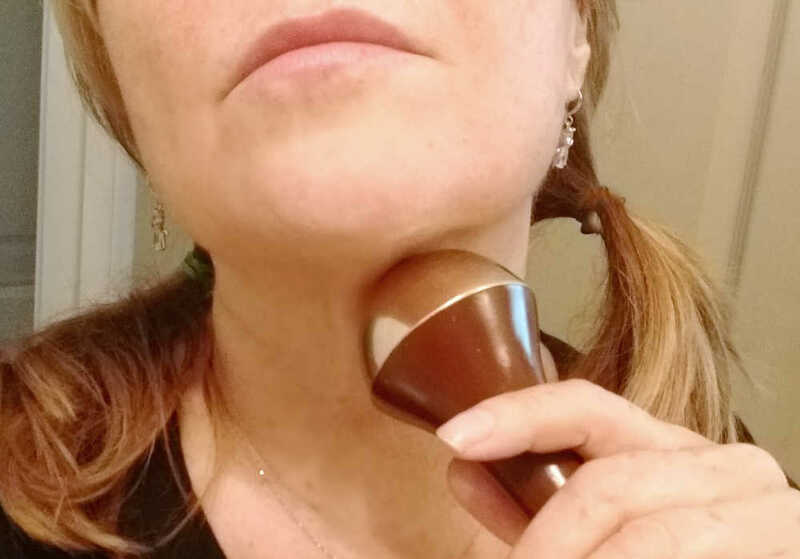 Slide the wand across your chin to the right side and slide down the right side of the neck. Then slide up the neck and back across to the left side of the under chin area and down the left side of the neck. Repeat this back and forth sliding motion 10 times or more. For best results do a full face massage from your forehead to your neck. It's pretty easy to use. Here is a sample video how the Kansa wand works. How long will it take to lose a double chin? The length of time, of course, will vary depending on age and how often you do the face exercise and facial massage. If your issue is due to fluid retention only - you'll most like notice a difference within hours of doing a massage. But, in general, people start to see some small changes within 2 weeks. I started to noticeable results in about 3 weeks. Dramatic results can be seen in about 6 months to a year. Once you start to see results…….you’ll be hooked. Consider taking before and after pictures every 3 weeks or so, this way you can document your results. 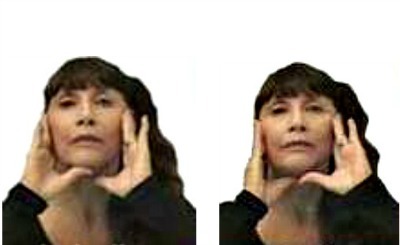 Sagging Face - See before and after pictures how facial exercises and massages helped tone the lower part of my face and double chin.